Statistics on traffic speed on Valley Road show that just 27% of drivers are operating at or within 5 mph of the posted speed limit. (click to expand). 3 out of every 4 drivers on Valley Road in Princeton speeds. That’s the shocking result of a traffic study commissioned by the Princeton Engineering Department, which was released as part of a recent community meeting. The posted speed limit on Valley Road is 25 mph. According to facts presented by Princeton engineers, however, just 27.2% of drivers, equivalent to about one driver in every four, drive at this speed. 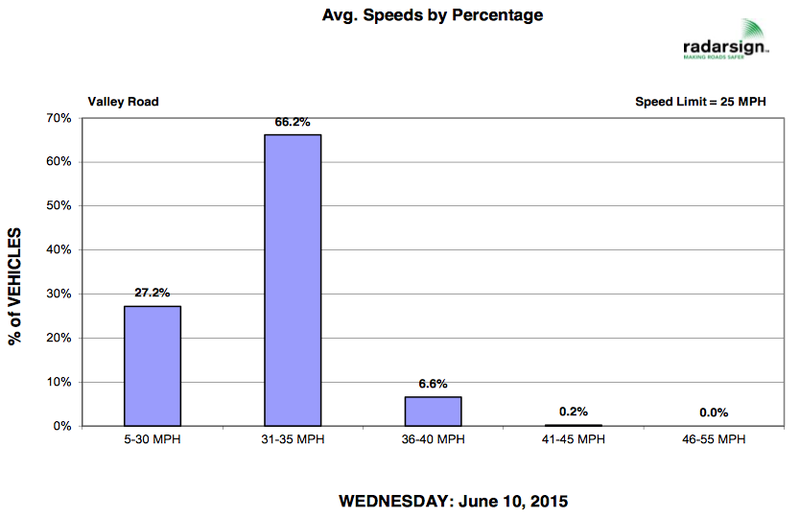 The rest are doing at least 5 mph over the posted speed limit, and the highest speed clocked was 50 mph. Speeding is not a problem of a small minority of drivers, but something that is more or less epidemic. The findings will come as no surprise to many Princeton residents, who regularly observe speeding in their neighborhoods. Speed is clearly an issue. Accident data shows that the chance of a pedestrian being seriously injured or killed if struck by a car is 45% if the car is travelling at 30 mph but only 5% at 20 mph. Princeton’s strategy to reduce speed relies heavily on the police moving an electronic sign displaying the speed of moving vehicles to different neighborhoods each week depending on which residents been complaining most loudly. The electronic signs do have an effect, at one particular place, for as long as the sign remains. But they remain a Band-Aid on a problem that requires a more meaningful fix. To protect people who aren’t in cars, more effective engineering solutions should be used to encourage drivers to take their time, and pay attention to their surroundings. But many anti-speed measures are not allowed. New speed bumps were banned by the town in 2013. 4-way ‘Stop’ intersections are prohibited by unofficial town policy. And speed cameras are not permitted by the state. Residents who have petitioned the town for lowered speed limits have run up against a rule called the ‘85th percentile policy‘, which says that if lots of drivers are speeding, then the speed limit must be set too low. That doesn’t mean that the town has no options to limit speed. The solution lies in reducing the ‘design speed’ of the road so that drivers are more likely to slow down. Reducing lane widths has been shown have this effect. Certain kinds of traffic calming solutions, which reduce the temptation to pump the gas, are also effective. This week we’ve also been reading: 8-year old Jersey City boy killed in hit-and-run (via nj.com), speculation about what would happen if rail tunnels to New York close (via transitism) and plans to make the center of Dublin, Ireland, completely car-free (via CityLab). This entry was posted in Biking, Complete Streets, Princeton, Traffic, Walking and tagged Complete streets, pedestrian safety, Princeton, safety, traffic. Bookmark the permalink.